According to EU regulation ECE -R 64 all newly homologated vehicles and camping cars must be equipped with a TPMS as from 1st November 2012. As from 1st November 2014 all newly registered vehicles and camping cars must have a TPMS. Tyre Pressure Monitoring Systems (TPMS) are systems built in vehicles to monitor the tyre pressure. A distinction is made between direct and indirect systems. If a loss of pressure in one or more tyres occurs, the driver will be alarmed directly about it on a display. How does a direct TPMS function? When using a direct system, a sensor measures the wheel air pressure and the tyre air temperature. This information is transmitted via radio to a control unit in the vehicle. Depending on the display concept, the driver can either constantly read the actual pressure values as a clear text on the display or query this information at the push of a button or receive only a warning for low tyre pressure. These systems can detect gradual and rapid pressure losses on tyres since they monitor the pressure in a direct way. How does an indirect TPMS function? Rolling circumference: In the case of a pressure drop in a tyre, the outer diameter of the wheel will reduce. The rotational speed of this wheel will increase in relation to other wheels. 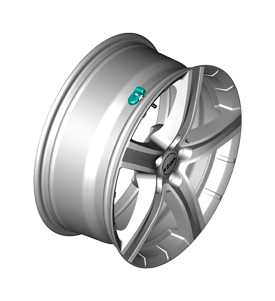 Frequency effect: The driving wheels show a specific vibration mode which is pressure-dependent and the system will detect a pressure loss from the change of the vibration mode. The direct TPMS gathers very accurate data and it can offer additional features such as tyre position detection, detection of pressure loss of a stationary car or control of the spare wheel. On the other hand, this system causes extra work when maintaining a vehicle or changing tyres. In addition, all wheels of the same vehicle (summer, winter, spare) must come ready with functioning sensors. In comparison, the indirect TPMS is less accurate in its functionality, since it cannot measure for example, temperatures or pressure. Neither can they measure pressure loss on stationary vehicles. However, the tyre changing is significantly easier with the indirect TPMS since it doesn’t depend on tyre sensors. In the long run this system may lead to wrong wheel pressure settings because the indirect system does not check the required tyre pressure but only registers deviations from the actual value. How does TPMS impact maintenance and service? The vehicle owner won’t be able carry out a tyre change by himself any longer. This is especially true for direct TPMS. In the case of a flat tyre or a faulty sensor, he will have to rely on services of a qualified workshop. Due to the widespread of this technology, workshops will be required to qualify their staff and invest in the appropriate Equipment. What legal requirements must TPMS comply with? Basically, according to the EU regulation, TPMS must be installed by the vehicle manufacturer at the factory. However, the EU regulation does not specify which tyre pressure monitoring system must be installed. Therefore, both direct and indirect systems are permitted, provided however, that they meet the requirements and conditions of the ECE -R 64. ECE –R 64 specifies only the functionality, not whether this functionality is supposed to be assured by an original sensor or by an accessory sensor. Thus, all these accessory sensors installed in the wheel are permitted. Important: A non-functioning TPMS detected during the general inspection is classified as a small fault according to § 29 Road Traffic Licensing Regulations, which must be promptly repaired by the vehicle owner.